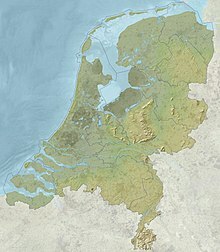 c. ^ While Amsterdam is the constitutional capital, The Hague is the seat of the government. 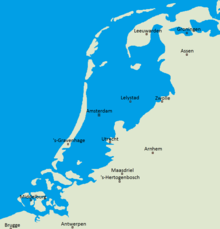 d. ^ West Frisian has official status in Friesland. 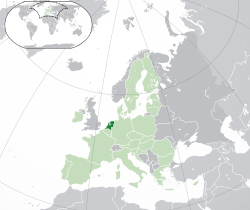 Dutch Low Saxon and Limburgish are recognised as regional languages by the European Charter for Regional or Minority Languages. Papiamento is recognised by the Dutch government in relation to Bonaire, and English in relation to Sint Eustatius and Saba. e. ^ The euro is used in the European part of the Netherlands and replaced the Dutch guilder in 2002. The US dollar is used in the Caribbean Netherlands and replaced the Netherlands Antillean guilder in 2011.
f. ^ CET and CEST are used in the European Netherlands, and AST is used in the Caribbean Netherlands. 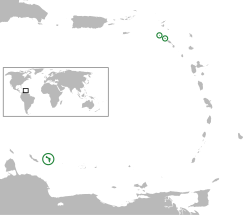 g. ^ 599 was the country code designated for the now dissolved Netherlands Antilles. The Caribbean Netherlands still use 599–7 (Bonaire), 599–3 (Sint Eustatius) and 599–4 (Saba). h. ^ .nl is the common internet top level domain name for the Netherlands. The .eu domain is also used, as it is shared with other European Union member states. .bq is designated, but not in use, for the Caribbean Netherlands. The Christmas flood of 1717 was the result of a northwesterly storm. In total, approximately 14,000 people drowned. ↑ Official CBS website containing all Dutch demographic statistics. Cbs.nl. Retrieved on 4 July 2017. ↑ "Population counter". Centraal Bureau voor de Statistiek. 2017. अभिगमन तिथि 17 August 2017. ↑ अ आ "Netherlands". International Monetary Fund. April 2016. ↑ "Gini coefficient of equivalised disposable income (source: SILC)". Eurostat Data Explorer. अभिगमन तिथि 4 December 2015. ↑ "2016 Human Development Report" (PDF). United Nations Development Programme. 2016. अभिगमन तिथि 21 March 2017. ↑ "Wet gebruik Friese taal in het rechtsverkeer" (डच में). wetten.nl. अभिगमन तिथि 25 October 2010. ↑ "Invoeringswet openbare lichamen Bonaire, Sint Eustatius en Saba" (डच में). wetten.nl. अभिगमन तिथि 1 January 2011. ↑ "Wet geldstelsel BES". Dutch government. 30 September 2010. अभिगमन तिथि 11 January 2014.